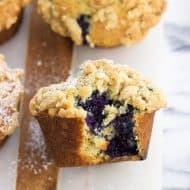 This blueberry muffin bread is tender and soft just like muffins and is bursting with fresh blueberries. 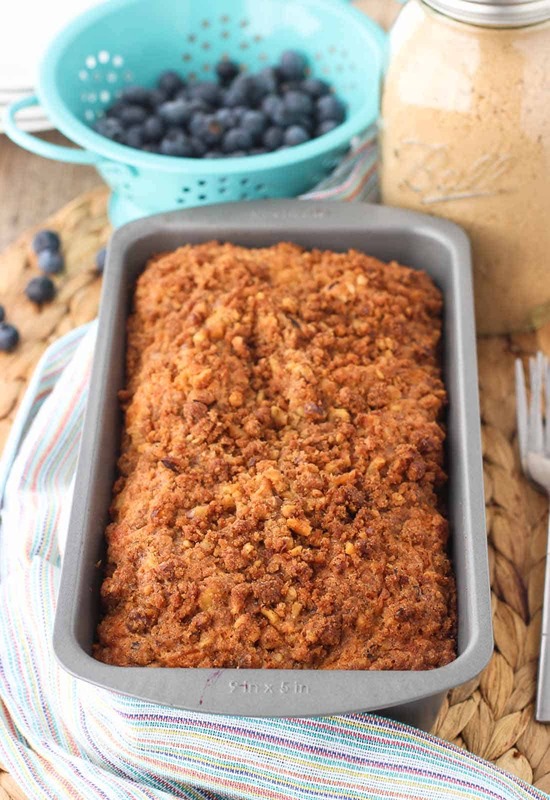 Topped with a walnut cinnamon streusel topping, this quick bread is sure to be a breakfast and snack favorite. Notice there haven’t been any ‘watch my snaps’ calls to action around these parts? The truth is I’m a liiiiiittle bit scared of video. Not scared in that the snap ghost will steal my soul, but of this higher expectation of bloggers to share, share, and share every little bit of their lives. First off, hearing my voice on tape is a horrifying experience (because I don’t have a NJ accent in real life, but it somehow sneaks in there on recordings…), and secondly, how many boring snaps can you snap in a row before they kick you off for being uncool? I think I’d be testing that limit. I so, so admire all of you who are early adopters of new things and jump in feet first. I really do! This is something I’m working on, being more go-with-the-flow and less OMG-I’d-totally-embarrass-myself-trying-something-new. I mean, it took me over a year to make a My Sequined Life Facebook page for whatever reason…obviously I need to contemplate video for at least twice as long. Anyway, I’m working up the courage to do so, but in the meantime – we have the serious task of talking about delicious carbs. *If* I had Snapchat/Periscope/etc., you might have seen me in my apartment kitchen, which is tucked into the windowless corner of our one main room making version numero uno of this bread. Just to get all the details out there, I was wearing black yoga pants and an old, ripped-up college t-shirt, cycling through my go-to cooking Spotify playlist (here <– if you’re curious to what I’m jamming to!). You would have seen me preheat the oven to too high of a temperature and open the oven door way too often while the first loaf was baking because I was worried it was browning too quickly (well, duh – things tend to do that when the oven is too hot). Then you would have heard a few choice words as I realized my little whoops above caused the center of the loaf to sink in something fierce, not unlike the craters asteroids leave behind. Nothing like being as inefficient as possible to make a girl stressed out about wasting precious weekend daylight! But the silver lining to all of this was that despite the sunken center, the first version of this blueberry muffin bread tasted just like I’d hoped for. 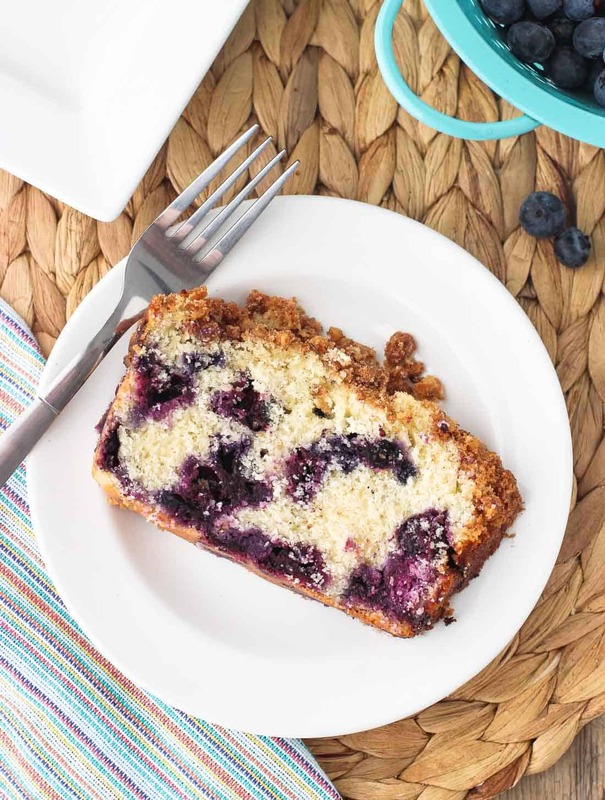 Like a soft muffin loaded with juicy blueberries and topped with a walnut cinnamon streusel layer – just in quick bread form! Basically a bunch of my breakfast top ten favorite things all rolled into one. So blueberry muffin bread numero due was quick to follow. This time I lowered the temperature to 350° F (from 375° the first time), wasn’t so impatient as it was baking and kept the oven door closed, and watched the loaf rise, rise, rise. Success! 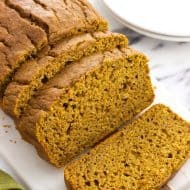 Now that it’s fall, I have quick breads on my mind. Not that they’re exclusively a fall/winter kind of thing, but there’s something about hanging around the kitchen smelling the bread as it bakes that’s just too good. 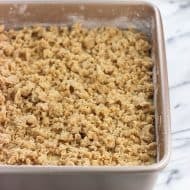 Especially when it’s topped with a walnut cinnamon streusel topping and you’re not sweating your face off for having the oven on for more than twenty minutes. 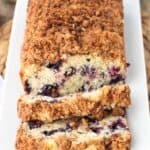 There are a few tips and tricks I like to use when it comes to quick breads, the first regarding fruit. I used fresh blueberries here, and after they were rinsed I made sure to carefully pat them dry to absorb as much excess moisture as I could. Then I tossed them with 1 tbsp of flour to coat the blueberries evenly. This slight flour coating helps prevent the berries from sinking to the bottom of the bread as it’s baking. Toward the end of the baking time, the top of the bread had become a nice golden brown color, but a long, thin tester inserted into the center of the bread still had a bit of wet batter stuck to it. I placed an aluminum foil tent over top of the bread and allowed it to continue baking until the center had risen and was fully cooked. Once the bread is done baking, don’t try to remove it from the loaf pan, or else you’ll end up with a crumbly (but delicious) mess! Place the bread (in the pan) on a wire rack and let it sit for at least 10-15 minutes to cool slightly. Then remove the bread to a wire rack to cool completely before slicing. So there’s a bit of delayed gratification involved here, but the end result is so worth it! Preheat oven to 350 degrees F. Spray bottom and sides of a 9" x 5" loaf pan with cooking spray (or grease with butter) and set aside. Rinse blueberries and pat dry as best you can. 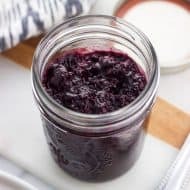 Toss blueberries in a bowl with 1 tbsp of all-purpose flour until they are all coated evenly. Set aside. In a large bowl or the bowl of a stand mixer, cream butter. Add 1 cup granulated sugar and continue to mix. Add eggs, vanilla extract, baking powder, and salt and mix in until mixture is smooth. Add the flour and buttermilk in two increments while the mixer is on low speed: add half of the flour (1 cup), and then half of the buttermilk (1/4 cup). Repeat with remaining flour and buttermilk and mix until just combined and there are no large lumps remaining. Fold in blueberries. Pour batter into prepared loaf pan. 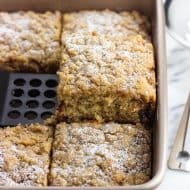 In a medium bowl, add all of the streusel ingredients and mix using a wooden spoon or a whisk so that there are no lumps of brown sugar remaining and the streusel is a semi-moist consistency that can clump easily. Scatter streusel evenly over top of the batter in the loaf pan. Bake for 45-50 minutes, or until the top has turned a nice golden brown color and a long, thin tester inserted into the center of the loaf comes out clean. If the top of the bread has browned before the middle is finished baking, place an aluminum foil "tent" over top of the loaf and continue to bake until the middle is done. Once done, remove pan from the oven and place the bread still in the pan on a wire rack to cool for at least 10-15 minutes. Use a knife to loosen the edges of the bread and carefully invert to remove to a wire rack to cool completely. Cut into slices once cooled (earlier could cause exceptionally crumbly slices). To make buttermilk on the fly, I added 1/2 tbsp white distilled vinegar to 1/2 cup 1% milk and let the mixture sit for 5-10 minutes. I used an uncooked piece of spaghetti as my long, thin tester! Just baked this up yesterday as instructed, and it came out exactly as pictured and described. 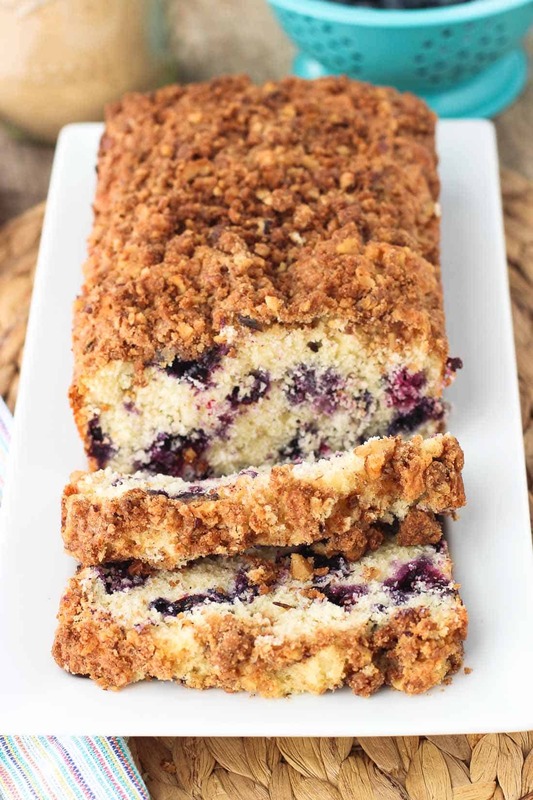 Tender, moist, full of berries, with such a nice streusel topping! I did use parchment paper to make a “sling” in my 9×5 loaf pan (I greased the pan and also the parchment); it made this loaf very easy to lift out of the pan. Thanks for the lovely recipe. Thank you Stacey! And yes, so agree on the streusel! Haha, my life is not glamorous enough to be streamed live 24/7 while I’m baking/the baby is crying! Lol. Oh man, I’m so hungry and all I want is bread! Pinned! Hahaha I’m glad to hear I’m not alone with “snap unworthy” moments! Thanks Ashley! Dang, girl!! This bread seriously looks like the blueberry bread to beat ’em all! Totally just want to sink my teeth into one of those extra-moist looking slices! Haha! Yes, there’s a reason that I’m not on snap chat, either, I’m pretty much always baking in my yoga pants, hair messy, no make-up these days. No one needs to see that! 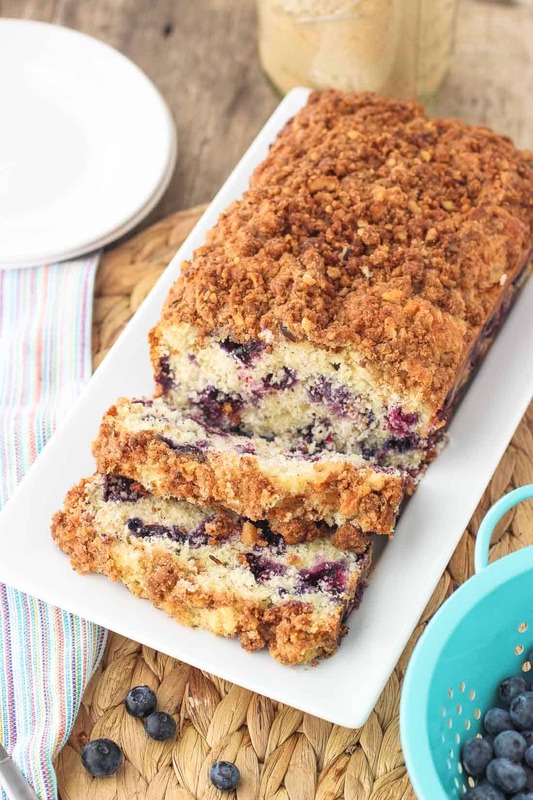 Love the looks of this blueberry bread…and that streusel sounds pretty amazing too! Haha that scene sounds pretttty familiar. 🙂 Thanks Denise! I would love to venture into videos and snapchats someday! I HATE hearing myself on video and feel like I’m always so awkward! This bread looks absolutely gorgeous, Alyssa! Your pictures are stunning! I just want to reach right through m y screen and grab the whole loaf. Love the crumbly topping! Thanks Gayle! I feel like if I took a video of myself I’d reshoot it a million times before posting something…and then freak out about how inefficient I was haha. Someday! But damn, blueberry muffin BREAD! Perfect!!! Even better than a muffin, hahaha Totally would eat the whole loaf for sure! Haha too funny Rebecca! Hearing my voice on answering machines always gets me. Like who is that?!? And thank you! I had to stick a big chunk of this bread in the freezer so it didn’t tempt me!